(Phys.org)—A team of researchers with Monash University and Australian National University has found that male superb fairy wrens are aware that their seasonal bright plumage attracts predators and take extra precautions because of it. In their paper published in Proceedings of the Royal Society B, the group describes experiments they carried out with the birds and what they learned about them. A lot of research has been done on male bird plumage and its impact on breeding, but little has been done to learn more about possible side-effects of such plumage displays. In this new effort, the researchers sought to learn more about how sporting bright feathers causes male faerie wrens to alter their behavior due to fear of increased attention from predators. Faerie wrens live in Australia and Tasmania—the natural coloring of both genders is soft brown and white. But just prior to mating season, some of the males shed their feathers and grow new ones that are several shades of blue to replace them. The feathers are quite naturally meant to attract females, but they also make it easier for predators to spot them. To learn more about how growing such plumage impacts male behavior, the researchers recorded predator warning calls by the birds and then played them back as a means of monitoring behavior. Because only some of the males turn blue for mating season, it was possible to compare the behavior of both blue and non-blue males, as well as that of females and younger birds. Also, because the males do not change color every year, it was possible to compare the behavior of males when hearing warning calls during times when they were blue, versus when they were not. The researchers report that males behaved much more cautiously during their blue periods compared to their behavior when they remained brown and compared to other males. They tended to be more sensitive to low-risk calls and responded faster to high-risk calls. They were also more likely to abandon activities they were engaged in prior to hearing a call. The researchers also found that other faerie wrens in the vicinity of the blue-plumed birds were less careful, though it was not clear if was because they felt that a predator would go for the blue bird or if they used the highly sensitive blue birds as sentries. 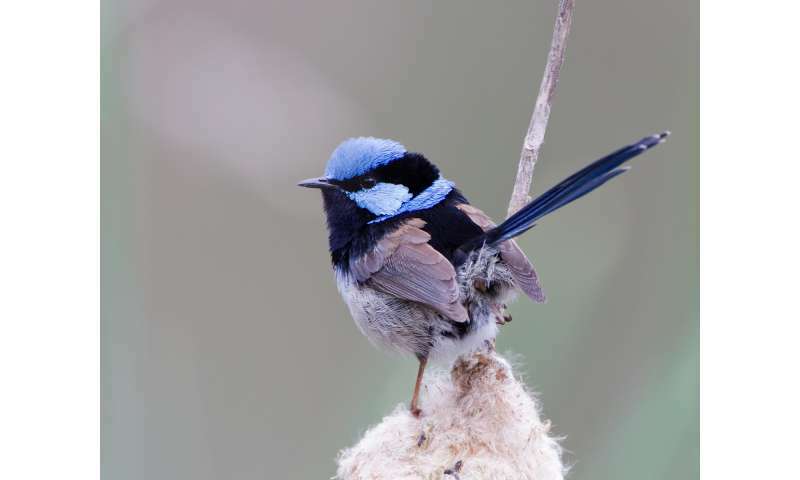 Why are so many fairy-wrens blue? Increased predation risk is considered a cost of having conspicuous colours, affecting the anti-predator behaviour of colourful animals. However, this is difficult to test, as individual factors often covary with colour and behaviour. We used alarm call playback and behavioural observations to assess whether individual birds adjust their response to risk according to their plumage colour. Male superb fairy-wrens (Malurus cyaneus) change from a dull brown to conspicuous blue plumage each year, allowing the behaviour of different coloured birds to be compared while controlling for within-individual effects. Because the timing of colour change varies among males, blue and brown birds can also be compared at the same time of year, controlling for seasonal effects on behaviour. While blue, fairy-wrens fled more often in response to alarm calls, and took longer to emerge from cover. Blue fairy-wrens also spent more time foraging in cover and being vigilant. Group members appeared to benefit from the presence of blue males, as they reduced their response to alarms, and allocated less time to sentinel behaviour when a blue male was close by. We suggest that fairy-wrens perceive themselves to be at a higher risk of predation while in conspicuous plumage and adjust their behaviour accordingly. "Faerie wrens live in Australia and Tasmania..."
Blockheads! The island state of Tasmania is part of Australia; it is not a separate country. That phrase makes as much sense as saying "... live in the United States and Hawai'i..."
I think they are just being geographical rather than geopolitical. If you said brown bears live in the US would you want me to understand you were talking about continental North America excluding or including Hawai'i?